A combination of lemon and clay to remove excess oil off your skin! Before starting the review, I would like to inform that this post is not for people with dry or acne prone skin, So if you fall in either of these two categories then you may kindly click on the red cross button of your screen. 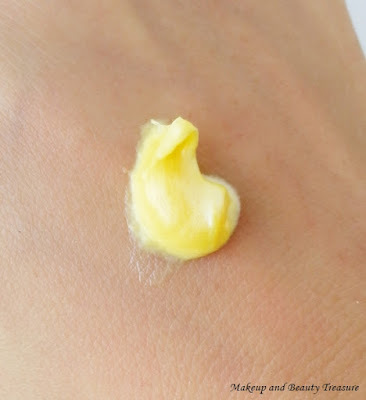 This post is for people with oily or combination skin! I bought Garnier White Complete Double Action Face Wash in rush but after going through the ingredients list, I regretted buying it as it contains comedogenic ingredients that are not at all good for my acne prone skin. So iIhanded it over to my cousin who has oily skin. The review has been written based on her experience with the product. Garnier White Complete Double Action Face Wash costs Rs 90 for 50ml. You can BUY ONLINE HERE. I loved the bright yellow packaging! Flip top lid is always my priority! Swatch is as good as the tube! Garnier White Complete Double Action Face Wash comes in a sturdy, bright plastic tube that looks apt for summer season. It has flip top lid that makes it convenient to take the product out without messing around. The scent is a mix of lemon and clay and is mild and pleasant. You need only a blob of face wash and it lathers richly. It is a foaming face wash and cleanses the skin thoroughly removing all dirt and oil. It does not leave any residue and makes skin clean and oil free. It also helps in removing tan off the skin though it never claims too. It might be due to the presence of lemon extracts! This face wash might be drying for dry skinned people as it contains lemon and clay that are meant to absorb excess oil off the skin. It contains myristic acid and stearic acid that are comedogenic ingredients and might break out your skin! - Tube packaging with a flip top lid. - Makes skin clean and clear. - Makes skin a bit dry so it is definitely not for people with dry skin. - Contains comedogenic ingredients so skip it if you have acne prone skin! Garnier White Complete Double Action Face Wash is a great face wash for oily skin. It removes all dirt and oil off the skin. Due to the presence of clay and lemon, my cousin feels it helps in removing tan with regular usage. I would definitely recommend it to people with oily skin! - Follow it up with a good moisturizer even if you have oily skin. - Take only a small amount as it lathers richly with a pea sized amount of face wash.
- You can also use it on the other tanned areas of the skin! Have you tried Garnier White Complete Double Action Face Wash? Did you find it good for your skin? Don't use it whilst your skin is breaking out. I'm going to try for sure.. Yes my cousin noticed her tan has reduced with this face wash! Do try it dear! Megha I have dry skin so I won't buy it for myself but my husband my oily skin sk maybe I will pick this up for him.Loved the bright yellow packaging. Do get it for your hubby Yamini. Its controls oil! Seems you have dry skin!